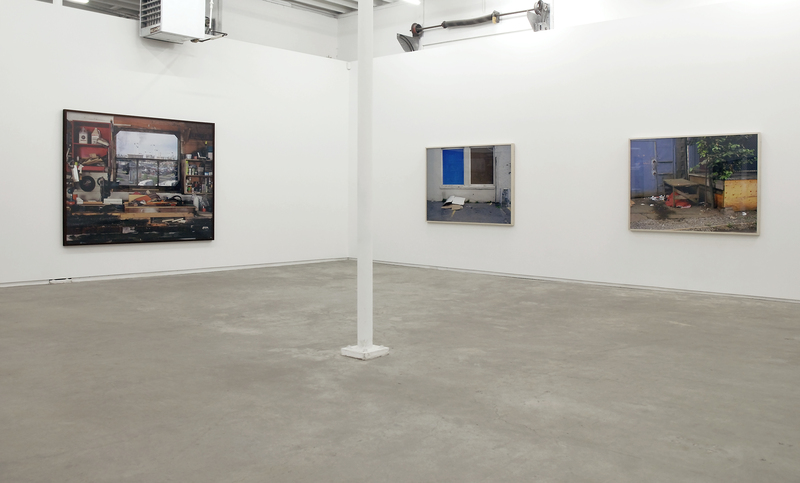 This exhibition at Catriona Jeffries featured new work by Christos Dikeakos. 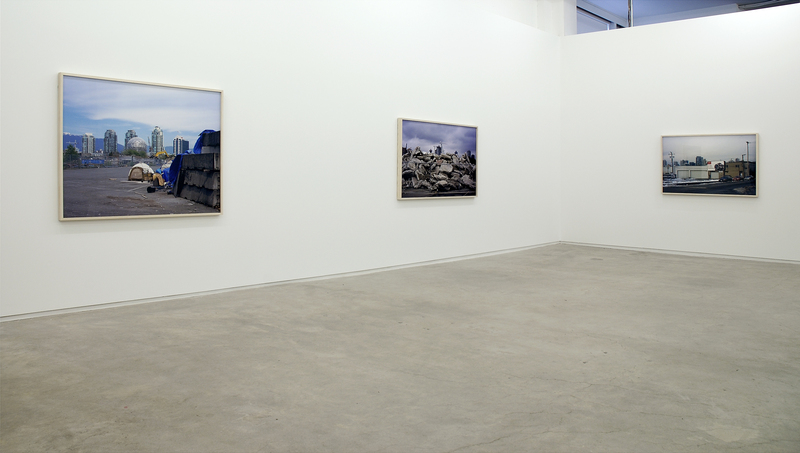 Grounded in the photo-conceptual traditions of Vancouver, which began in the late 1960s, Dikeakos’ photography practice has consistently explored local histories, the conditions of modernity and the socio-economic relations of particular sites. 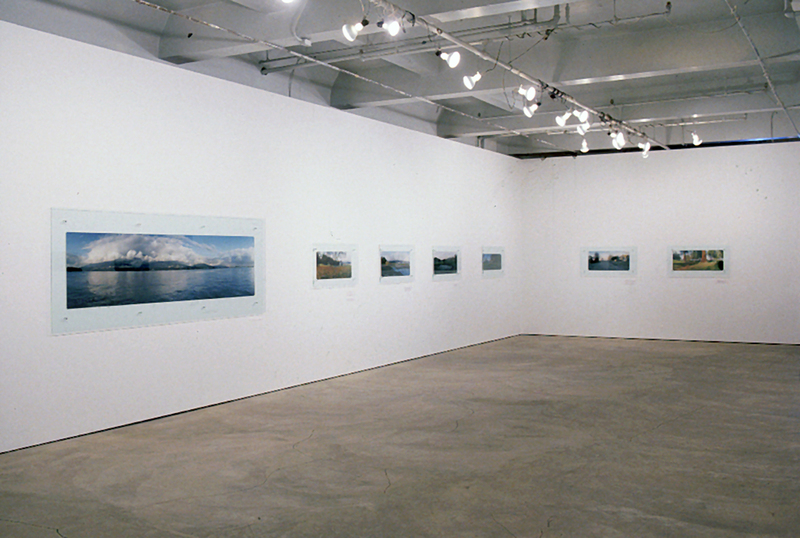 For approximately forty years Dikeakos has focused his attention on the changing landscape surrounding the False Creek inlet which cuts into the eastside of Vancouver. Traditionally used as hunting and fishing grounds by First Nations peoples, the area bordering this waterway has undergone transformation from an industrial hub (filled in to accommodate the CPR rail route and roadways in the early 1900s), to an area marked by a fraught history of urban renewal and international exhibition, hosting the world Expo in 1986 and now the upcoming 2010 winter Olympics. 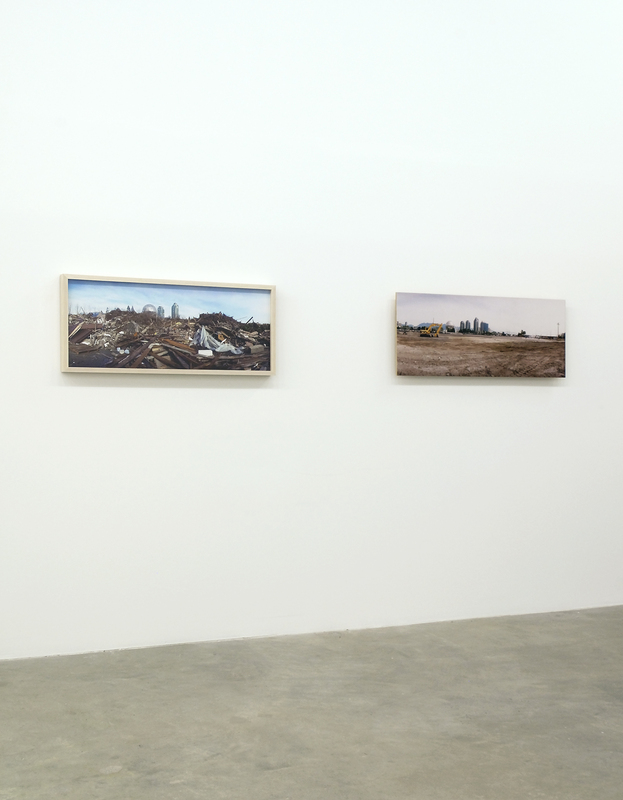 Dikeakos’ persistent picturing of this zone, often as a de-featured and constantly shifting landscape, with Vancouver’s iconic and touristic mountains and high-rises forming the backdrop, considers the site in relation to larger economic and ideological shifts occurring globally. In this exhibition, Dikeakos’ photographs reveal a moment of rapid development in which Vancouver’s presence on the world stage and the creation of a new imagined neighbourhood for a privileged class is causing counter-movements in the nomadic urban underclass. Places of production, such as the building in which Dikeakos and other artists have studios nearby, are now becoming temporary shelters for the homeless. In Window View, Main Street, Dikeakos’ large-scale frame within a frame showing the Lego-like progression of towers and cranes through the window of an increasingly extinct working environment crammed with tools and materials, exposes the polemic between sites of production and consumption/domestication. The rapidly changing exterior landscape is framed by a painterly studio still-life arrested in time. As with past works in which Dikeakos has superimposed First Nations place names onto the urban landscape, in this project he also marks a moment in history which pre-supposes an erasure of what came before. 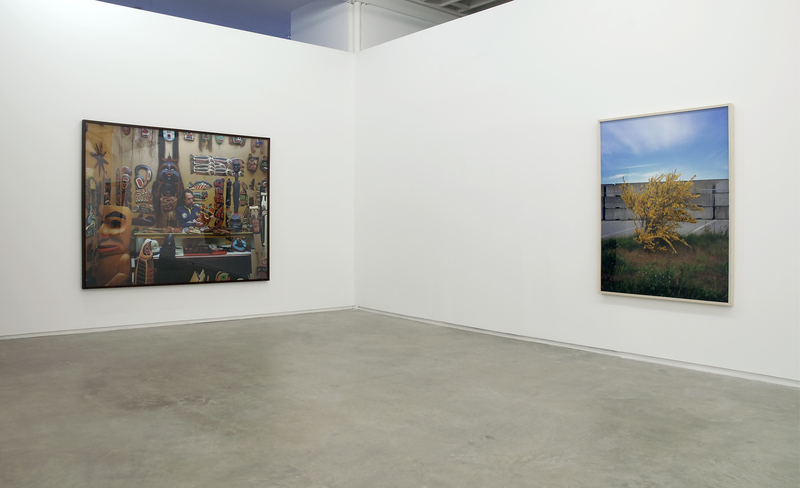 These reflections are similarly interwoven into Dikeakos’ most recent work The Room, 3 Vets which offers a rare close-up view of a local First Nations art gallery/curio store located at the back of an army surplus shop. Through his attention to the history of the photographic medium and his careful mapping of these sites, Dikeakos’ new body of work engages with the microcosm as a way of speaking to the close interstices between the local and global at a time when these issues are at the forefront of mainstream consciousness.